Description: Do you have a PDF (Adobe Acrobat) file which cannot be printed, copied, or edited? Your PDF file has had password security and other restrictions added.With A-PDF Restrictions Remover, you can remove the password and restrictions in a few seconds. FREE 15 day trial and only $9.99. Description: The free product can hide and protect folders on your computer to ensure security of your privacy. It is very useful if you want to keep your files away from peoples's prying eyes. The hidden folders are invisible in Windows Explorer and can not be found by Windows Search. Absolute Folder Hider is very easy to understand and use. Lauch the program, add folders and click Hide button. Done! You can protect your folders with just these 1-2-3 steps! Description: The protection of your sensitive data is often disregarded. But the encrypting of diaries, pictures or other secret documents with the AES- or Blowfish-Algorithm is relatively simple. With the help of the Easy Encryption Technologie (EEnTe) you need only to enter a password or to insert the EC MoneyCard or certificate smartcard (PKCS). The software in additional support the compressing in the ZIP-format and signing of files. Description: The protection of the computer and stored files against undesirable access is more and more important. This Security-Suite offers innovative and professional security and encryption modules for private and business use. Beside the password- or certificate-based encryption you can protect the computer against illegal access or ultimate delete files. 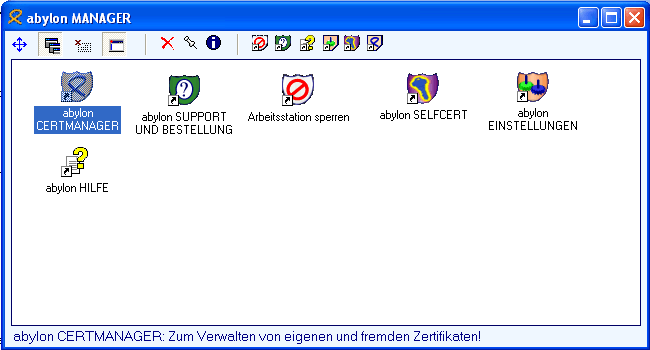 Description: The encrypting with the software of abylonsoft is not an one-way. The free READER-Version verify, decrypt and unpack SME files. At this time the following file extensions are supported (Symmetrical Encrypted: CR2 / Asymmetrical Encrypted: CRP, PK7, P7M, VSP7, ASC, TBE / Signed: P7M, VSP7, TBS, SGN / Digital Envelope Files: SME). The functions are offered simply by the right mouse button of the File Explorer. Description: Safe your files on an encrypted file clipboard (local, network, ftp-server) and protect the data against illegal access. 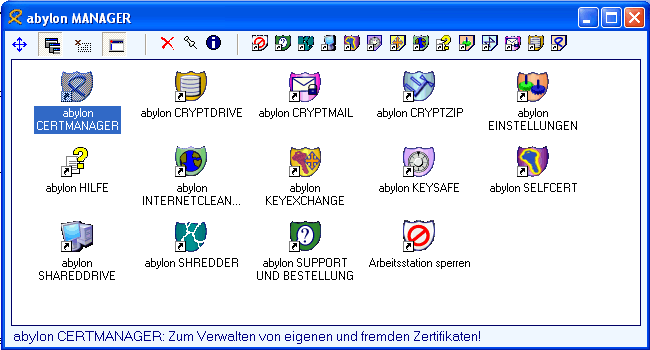 The abylon SHAREDDRIVE (encrypted data drive) is full integrated in the File Explorer and supports the simultaneous access by several users. Only with correct password, USB stick, smart card or certificate the access is possible. The encrypting are automatically in the background, without additional operation via the user. Description: Lost a password to an MS Excel workbook? Lost passwords for modifying sheets in an MS Excel workbook? Accent EXCEL Password Recovery will break the passwords and allow you to access your documents again! Passwords to workbook sheets are found almost instantly. To reduce the time of searching for a password to a workbook, the program has three search methods: a brute-force attack, an attack by an enhanced mask, an enhanced dictionary-based attack. Description: You don't need to be a hacker in order to recover a lost password from an Office document. Accent OFFICE Password Recovery supports a wide range of Office document formats and includes a handy Wizard that helps you to choose proper password recovery algorithms. Recover lost passwords quickly and easily! Description: Lost a Microsoft Word password? No problem! Breaking passwords for opening documents and saving changes; three types of attacks (brute-force, attack by an enhanced mask, enhanced dictionary-based attack); flexible, customizable password search options; help through all stages of the search. You can find it all in Accent WORD Password Recovery. Try the limited version for free and discover that everyone can effectively recover lost passwords! Description: Access Administrator Pro is intended for controlling access to files and folders situated on local media of Windows 95/98/ME/NT/2000/XP at Windows kernel level. It alows to allocate access to files and folders between users according to predefined schedules, and protects system files and folders such as the Windows System, Registry and Swap files.